FBI special agent Peter Strzok has been stripped of his security clearance, days after he was physically escorted out of his FBI office, said Attorney General Jeff Sessions. 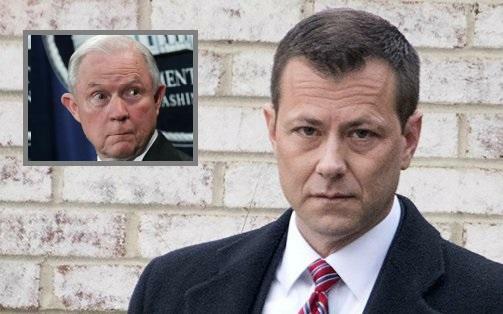 Speaking with radio host Howie Carr and first reported by Chuck Ross of the Daily Caller, Sessions said "Mr. Strzok, as I understand, has lost his security clearance." Strzok, was in charge of both FBI investigations into both Hillary Clinton and Donald Trump, harbored extreme animus towards the latter - as revealed within a batch of 50,00 text messages he sent to his mistress - FBI attorney Lisa Page. Page quit shortly before the publication of a report by the DOJ's Inspector General, while Strzok - who had been relegated to the HR department following his removal from special counsel Robert Mueller's Trump-Russia probe, stayed on with the FBI - only to be escorted out last Friday and has now reportedly lost his security clearance. News - FBI special agent Peter Strzok was escorted out of the FBI building on Friday, source familiar tells me; as of today, he is still employed; he's been stationed in Human Resources since dismissal from Mueller team. As we noted on Tuesday, shortly after the IG report was released, Strzok's attorney confirmed the report saying that Strzok was escorted from the building amid an internal review of his conduct. "Pete has steadfastly played by the rules and respected the process, and yet he continues to be the target of unfounded personal attacks, political games and inappropriate information leaks," his attorney Aitan Goelman said in a statement. It gets better: in the layer letter, attorney Goelman writes that "Pete has steadfastly played by the rules and respected the process, and yet he continues to be the target of unfounded personal attacks, political games and inappropriate information leaks." But wait, it gets even better, because in the very next line Strzok's attorney complains about the "impartiality of the disciplinary process, which now appears tainted by political influence." Yes, this coming from the "impartial" and "unbiased" FBI agent who led a failed coup against the president, vowing to "stop" Trump, an act which in another time would have much more serious consequences than simple termination and being expelled from the FBI. And speaking of that, the lawyer next complained that "instead of publicly calling for a long-serving FBI agent to be summarily fired, politicians should allow the disciplinary process to play out free from political pressure." We are confident that everyone will be very interested in watching the "impartial" disciplinary process play out fully in the coming months. 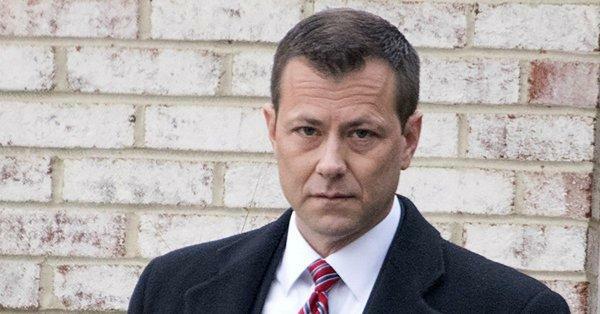 Goelman's conclusion: "Despite being put through a highly questionable process, Pete has complied with every FBI procedure, including being escorted from the building as part of the ongoing internal proceedings." It was not clear how Pete could not have complied with being escorted from the building but we'll leave it at that. While Strzok's career at the FBI now finally appears over (with possible disciplinary consequences to follow), many questions remain including some revelations made later in day by the Inspector General Horowitz, who during a hearing on Tuesday said that he's no longer convinced the FBI was collecting all of Strzok's and Page's text messages even outside the 5-month blackout period when it archived none of the texts due to a technical "glitch", which means a number of other Strzok responses to Page likely missing. Most importantly however, Horowitz ended an MSM talking point, clarifying that "we did NOT find no bias in regard to the October 2016 events." Strzok's choice to make pursuing the Russia espionage case a bigger priority than reopening the Clinton espionage case suggested "that was a BIASED decision." In other words, as we noted last week, Strzok was clearly biased in his pursuit of Trump and dismissal of Clinton: a perversion of the entire FBI process. Shooting down a Dem/MSM talking point, Horowitz testified, "We did NOT find no bias in regard to the October 2016 events." Strzok's choice to make pursuing the Russia espionage case a bigger priority than reopening the Clinton espionage case suggested "that was a BIASED decision"
To all this, all we can add is that while there is still zero evidence that Trump "colluded" with Russia, Strzok's expulsion from the FBI building - and now losing his security clearance - is a serious indicator that the FBI was engaged in what effectively amounts to collusion, if not conspiracy, against a democratically elected US president.